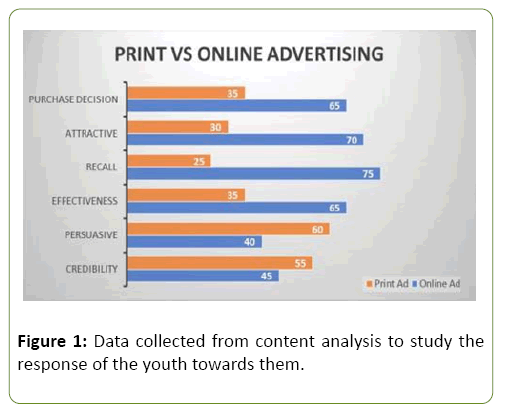 Citation: Vinaya Kumar CM, Mehrotra S. Print vs. Online Advertising: Impact on Buying Behavior of Youth. Global Media Journal 2018, 16:31. Copyright: © 2018 Vinaya Kumar CM, et al. This is an open-access article distributed under the terms of the Creative Commons Attribution License, which permits unrestricted use, distribution, and reproduction in any medium, provided the original author and source are credited. The present study would help the advertisers to understand the preference of youth towards print and online advertising. This study will attempt to study how advertiser' can use these mediums to make their products popular among youth. This study will also be beneficial to analyze as to how consumers perceive the online advertisements and print advertisements and what are their parameters for making buying decisions. Everyday youth are exposed to information of various products and services through advertisements. This extreme amount of media in our daily lives cannot be side lined and it has impact on all those exposed to it. It is reflection of the society of which we are a part and is a mirror-image for all practical purposes and has a tremendous influence on the social, cultural and moral values of the youth. Advertisements start with persuading the customer due to the new benefits that the Product promises to deliver to the customer. Many marketers have either increased their spending on the online media, or have switched from the print media as they online media/ is more promising in terms of revenue generation. This does not necessarily mean that print media will decline. Many studies have indicated that digital advertising works in conjunction with TV, print, and other traditional media to generate the greater increase in marketing effectiveness . Today’s youth are way more exposed to information than they had a couple of years back. The development of technology has brought about massive change in the lifestyle of youth. The kind of involvement these youths have towards online media makes one rethink the degree of impact these advertisements have on youth’s perception. Online media is becoming one of the best ways of persuasive communication. Youth spends maximum time on online media to gather information. Through advertisements from different media one gets knowhow of different cultures and lifestyles. There are numerous advertisements which are influencing the purchase decisions of youth. Nearly everyone grows up in the world which is flooded with the mass media e.g. television, advertising, films, videos, billboards, magazines, movies, music, newspapers, and internet . Different forms of advertising plays pivotal role in updating people's preferences of products and services. New media, largely the internet, has apparently become an essential source of information today. Advertisers all over the world eye covetously at the expanding opportunities provided by the webs, seeking more effective communication channels with their target markets . Online advertising expenditure, including web ads, is continuously on the rise, especially due to its power of collaboration with television and print advertisements. With the increased adoption of ad fission of the internet, World Wide Web is becoming gradually a typical advertisement platform. The web is offering business advertisements world with rich media tool, interactive series and global reach . It is fascinating to study that where so much of research has been conducted regarding future of online advertising and the consumer behaviour towards it, less emphasis has been given to online advertisements and their layouts that are carried on the homepages of different websites. Though people enjoy looking at internet advertisements, its formativeness and utility for making behavioral purchasing decisions also plays a key role . • To compare print and online advertising with reference to buying behaviour of youth. • To decide on the effective way to advertise products and services to youth. • To find which medium is more persuasive among youth. The internet is like no other communication medium because of its skill to combine several of the exclusive qualities of each medium (that is, print, sound, and visual) into one, while allowing for interactive communication between advertiser and customer. This vast array of traits makes the internet attractive as the new communication tool of the future and one that seems already to be catching the eyes of youth and advertisers alike. Consumers' attitudes toward advertising have been considered important to track because they likely influence consumers' exposure, attention, and reaction to individual ads  through a variety of cognitive and affective processes . With many forms of internet advertising, however, the consumer has a great deal of control over advertising exposure. The company may request the consumers' attention but the interactive nature on online advertisements gives users more control over the exposure. When we compare print and online advertising, results have been ambiguous. As per the study by Sundar et al. , in terms of memory measures, print medium is superior to online medium, attributing the effect to the innovation of online advertisement, the delivery mechanism and users' expectations. Foster, and Parsons (2001) and Gallagher in their study used advertising hyper-linked to a related text and concluded that both the mediums of advertising are equally effective. Effectiveness of the advertising depends on the users’ receptiveness and attitude towards an advertisement. Metha  found that respondents who have more positive attitude towards advertising have greater day-after recall value of the advertisements. In online advertising, it is frequent that advertising is done with forced level of exposure . In internet advertising, higher intrusiveness leads to ad avoidance and irritation , which leads to a less favorable attitude among consumers. Another aspect of comparison between both forms of advertising is the control over advertising exposure. In print medium advertising consumer has relatively inactive role in exposure to advertisements. To study the objectives of present research, survey was conducted on college going youth exposed to both print and online media. Sample size of 100 was taken comprising on 50 male and female students each. Questionnaire was administered to them which comprised of close ended questions. The options in the questionnaire are based on the data collected from content analysis to study the response of the youth towards them. The data collected is presented in the form of graph given below (Figure 1). Figure 1: Data collected from content analysis to study the response of the youth towards them. • When asked about the effectiveness of the medium, respondents preferred online medium over print medium. This reflects that youth spend more time online and they find online advertisements to be more effective. • When respondents were asked which form of advertising is more persuasive they favored print media advertising? Print as the traditional medium of advertising is more persuasive medium. • When respondents were asked about interactive nature of advertisements, they found online advertisements to be more interactive. Multimedia nature of online advertisements makes it more interactive. • When asked about recall value of the advertisement, they remembered more of online advertisements. Since youth is more exposed to online media, they can recall more of online advertisements. • When respondents were asked about attractive nature of advertisements, they opine print to be more attractive. The visual element of print advertisements makes it more attractive amongst youth. • When respondents were asked about purchase decision, they opine that they made purchase decision after getting influenced by online ads. This finding emphasize that online medium can play a major role in increasing the revenue of advertisers. The study highlights the fact that online advertising is indeed the most effective medium of advertising when the focus is on the youth. The advertisers should fully explore the potential of online as a effective advertising medium. The advertisers should use the new technology in such a way that two or more media can be combined. This prospect will offer great new avenues to be exploited. Since the credibility and persuasive nature of print media is high so advertisers should come up with a marketing mix which focuses on both print and online media. Advertisers must focus their attention on popular media mix but also on the mediums which are preferred by youth’s. Though the credibility of print medium has not declined, we cannot ignore the growing usage of online media for day to day activities. Today’s youth is more attracted to online media as compared to print media. In majority of cases appropriate and comprehensive media mix is the best solution. The study concluded that effective print advertising will increase online buying. Youth as target customers can be targeted through the proper media -mix with major emphasis on online advertising. Print advertising will increase the credibility of the advertisements. In today’s scenario focus on both print as well as online media is important. Blend of both the mediums will be effective in targeting the youth as per their preferences and desires. Koetsier J (2014) Digital advertising hits $43B, passing broadcast TV for the first time ever. Internet Advertising Bureau. Abdul L, Salman S, Zain AU (2011) Influence of Role Model on Pakistani Urban Teenager’s Purchase Behaviour. European Journal of Economics, Finance and Administrative Sciences 31: 07-16. Chitra V, Kothai S (2014) Consumers Attitude on Television Advertisements. IRACST. Gaurav B, Gupta SK (2013) Online advertising and its impact on Consumer buying behaviour. International Journal of Research in Finance & Marketing V: 3. Ahn E, Edward SM (2002) Brand attitude versus click-through response to banner ads. Paper presented at the American Academy of Advertising. Alwitt LF, Prabhakar PR (1992) Functional and Belief Dimensions of Attitudes to Television Advertising. Journal of Advertising Research 32: 30–42. Lutz RJ (1985) Affective and cognitive antecedents of attitude toward the ad: A conceptual framework. In: Alwitt LF, Mitchell AA (Eds. ), Psychological Processes and Advertising Effects: Theory, Research, and Application. Hillsboro, NJ: Erlbaum. Sundar SS, Narayan S, Obregon R, Uppal C (1998) Does web advertising work? Memory for print vs. online media. Journalism and Mass Communication Quarterly 75: 822-835. Metha A (2000) Advertising attitudes and advertising effectiveness. Journal of advertising research 40: 67-72. Chang-Hoan C, Jung-Gyo L, Tharp M (2001) Different forced-exposure levels to banner advertisements. Journal of Advertising Research 41: 45-56. Steven EM, Li H, Joo-Hyun L (2002) Forced Exposure and psychological reactance: Antecedents and consequences of the perceived intrusiveness of pop-up ads. Journal of Advertising 31: 83-95.